Is there a road map that guides us to an understanding of each other when it starts with secrets & lies? 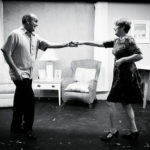 You can find out when the comedy drama “Six Dance Lessons In Six Weeks” opens at Amelia Musical Playhouse on July 6th. The Hollywood Reporter calls it “Thoughtful, razor sharp, charming, funny and genuinely moving.” The middle-age former Broadway dancer, Michael Minetti, (Carey Dresser) arrives at the Florida condo of past-middle-age Lily Harrison (Arlene Filkoff) to give her a series of dance lessons over six weeks. Before they can begin, their personalities clash - she is strait-laced and untrusting, the wife of a Southern Baptist minister; he uses foul language instinctively & has little control over his temper. This comically poignant duet has been a popular showcase for the likes of Gena Rowlands and Cheyenne Jackson, Uta Hagen and David Hyde Pierce, Claire Bloom and Billy Zane, Polly Bergen and Mark Hamill as well as Filkoff and Dresser who are reprising their roles from a 2009 production of “Six Dance Lessons” at Amelia Community Theatre. As the script unfolds the audience gets to eavesdrop on their private conversations as each character slowly reveals more about themselves in very surprising ways. They teach each other the dance that is life in this transcendent story of compassion, love and survival. Author Richard Alfieri tosses out many wonderful one liners and the cast loves delivering them. Be ready for a roller coaster ride of emotions including some touching poignant moments but a lot of belly laughs! Produced by special arrangement with Samuel French, Inc. Written by Richard Alfieri.